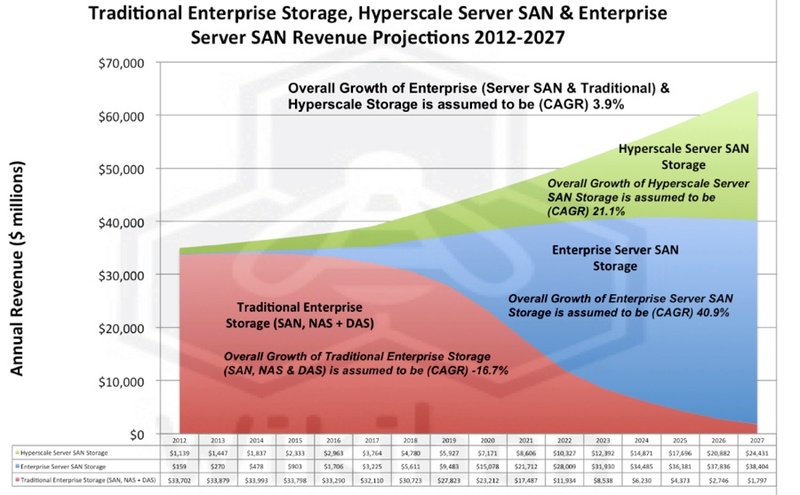 Analysts are unanimous that the total revenue of traditional enterprise storage systems is declining at 3% per year. This not due to a drop in enterprise Petabytes! AWS storage adoption is amazing, but it’s still a drop in the bucket compared to on-premise capacity, which continues to grow, up to 40% YOY by some accounts. Enterprise storage is shrinking because technology developments are bringing lowered costs to customers, and those costs are declining faster than the Petabytes are growing. Who do customers have to thank for this gift? 1) Media prices: Pricing for media follow elastic curves of demand and supply, which in turn follow the growth in bit-density and factory yields. Triple-level vertically stacked flash have successfully killed the market for 10K and 15K rpm 'enterprise' drives (notwithstanding 2017's Flash capacity shortages). And density-boosting HDD technologies such as Helium and shingled recording are showing that the technology for spinning rust will continue to deliver lower $-per-TB. 2) All-Flash-Array adoption: Although almost all AFA’s carry high price tags, they’re far more efficient at delivering IOPS for tier-1 workloads. Enterprises commonly sized HDD-based tier-1 systems like Vmax based number-of-spindles to achieve an IOPS target, with little regard to capacity efficiency. Customers grew comfortable with techniques like short-stroking, which purposefully abandoned lots of Petabytes. With AFA’s, fast dedupe, and NVMe, IOPS requirements can be met with far fewer spindles and a lower capacity footprint. Bottom line; Database users can get the same IOPS for a much lower investment, and this cannibalizes the revenue for high-end enterprise arrays. 3) Software-Defined-Storage: The performance efficiency delivered by AFA’s doesn’t help when it comes to unstructured data. Backup, archival, logging, analytics, preservation, multimedia, seismic, and surveillance require cheap & deep to affordably retain their digital assets. This market is in transition to becoming dominated by SDS solutions, in particular scale-out NAS and Object Storage. Popular solutions such as Isilon are now being recognized as expensive, inflexible, and languishing under EMC in terms of roadmap developments. Meanwhile startups like NooBaa are proving that there's lots of opportunity to reduce cost and improve flexibility using smarter software. Where is the innovation? Hint: It’s not in the big OEMs! If you’re a storage buyer you’re risk-averse. Your long-standing relationship with EMC or HP is testimony to budget conditioning, and the OEM's ability to deliver “good enough” products including inorganic offerings such as XtremIO and Isilon. But this math has changed. You can no longer look to the large OEMs to innovate. In the present climate, large OEMs will do everything in their power to perpetuate high-margin products while real innovation occurs in the startup community. The shrinking earnings pool will result in R&D and M&A cutbacks, while emphasizing preservation of cash-cow products. Furthermore, large M&A deals impose an immense debt burden on cash-flows and debt re-payment doubles the pressure on Opex. In other words, Dell/EMC is not going to be acquiring any innovative storage technologies any time soon. If you are not spending 30% of your vendor interactions looking at novel technologies from vendors like NooBaa, then you will not maintain competitiveness. Emerging technology startups are where innovation is happening, and choosing innovation is the way to follow the commodity curves. When was the last time you scheduled a demo with a startup? When was the last time you gave technical feedback on a new product? When was the last time you told a vendor why the answer was “no”? Now’s the time folks, EMC is no longer here to help.